During the last few weeks we have worked on dozens of life, long term care, disability and annuity cases working alongside our Advisers. If you are not discussing these issues with your clients then who will? Case 1 – Premium Finance – No Collateral: A top financial adviser called to discuss a case for a high wage earner that needed life insurance protection now and wanted to add a significant supplemental tax-free income to his retirement plan. Doctor Age 56. A max funded Indexed Life Program was designed with a premium finance option to keep out of pocket amounts at a minimum. Projected Tax Free Income at age 69: $82,000 Annual for life. You can do this! One case a year could really boost your practice and help a client. Call or E-mail Nancy Woo, Director of Life Marketing, to help you design a case today. Case 1 – Premium Finance Case – this option can fit many client scenarios: A top financial adviser called to discuss a case for a high wage earner that needed life insurance protection and add a significant supplemental tax-free income to his retirement plan. Doctor Age 51. Projected Tax Free Income at age 65: $95,000 Annual for life. Case 1 – Life Insurance Needs Analysis: A top financial adviser called to discuss a case where the couple did not have any life insurance and wasn’t sure even if life insurance was necessary. After some discussion we had him run a couple of what if strategies using his financial planning software. What if wife died today – Calculate expected net worth of her surviving husband at his age 100. Even though their plan looked solid with both living a long life, as individuals not so much. We found that with his passing the hypothetical took her to her mid 90’s – we could accept this risk with their real estate equity as a backstop. We found that with her passing, the hypothetical only took him to about age 81 and then the plan failed. This was due to her Social Security and single life pension that would cease. We then ran, various scenarios to place an affordable term life insurance amount on her that might make sense. We found that if we put a 20 year $500,000 term on her and she passes anytime in the 20 year period, his plan succeeds. If she passed after the 20 year term with no insurance proceeds for him, then his plan still succeeds through his mid 90’s. This was an acceptable risk with their real estate equity as a back stop. Luckily this couple already had a LTC protection program in place, otherwise a significant LTC event for either of them would have been devastating. Each year, we typically see people setting new year resolutions. Unfortunately, most resolutions don’t hold up for more than a week or two, and we don’t think that’s right, especially if you’re a financial professional. 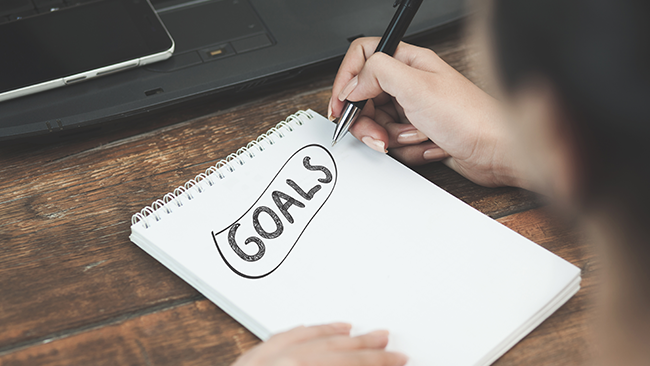 If you look at some of the most successful financial professionals in our industry, they all tend to not only set these four goals, they also continually measure their success toward accomplishing their goals. Hands down, the most successful financial professionals establish a yearly prospecting goal. In other words, they identify the total number of new prospects they’d like to get in front of this year. To accomplish this goal, you need to plan out your prospecting activities and set aside a realistic budget and follow-through. You can accomplish this plan on your own, but maybe it’s something you should be delegating to your assistant. If you think you can’t afford to hire an assistant, click here to learn the real truth behind one of the most value members you should have on your team. It’s also important to leverage a prospecting program that has already produced results in the real world. There are many organizations and consultants out there ready to separate you from your hard-earned money on a program that just doesn’t work, so be sure to look at a prospecting program that has been vetted and can produce meaningful results. What do meaningful results mean? That really depends, but a benchmark you should be shooting for is 20 buying units (couples or head-of-household) per prospecting event. If you conduct just 1 prospecting event per month, your prospecting goal would be 120 units. At two prospecting events per month, that would lead to 240 units, but that only gets you so far, you need a lead conversion goal. There are many financial professionals out there when asked, “how many prospects do you convert into clients” they’ll say they convert 9 out of 10, or something along those lines. In other words, they claim every prospect they meet converts into a client. While that very well may be true, the fact is most financial professionals have never tracked their results, and at the core of every sales professional there tends to be a cognitive bias – sometimes known as the certainty effect. This is when people over weigh outcomes that are considered certain relative to outcomes that are merely possible. Yes, it is possible that you will convert every prospect you encounter, but the reality is that the actual conversion is significantly lower, which is why you need to not only have a conversion goal, but also a metric to quantify your results. The reason you need the goal and the metric is that you want to spend your prospecting dollars on the activities that generate the best results. If you conduct one prospecting program and it generates 10 buying units, but you only convert 1, whereas another prospecting program generates 5 buying units and you convert 4, which program should you do more of … assuming the price is the same for both programs? The answer is, it depends on how much revenue gets generated. If that 10-to-1 conversion lead to revenue of $10,000, and the other program that lead to four-out-of-five conversions leads to a total of $4,000 in revenue, it’s pretty clear which one is the winner. That’s why it’s important to set a conversion goal, which may be related more to the cost of the program and the revenue generated, not necessarily the number of people who convert. When thinking through your conversion goal, you should also consider developing and sharing your sales process. If you want to learn more about why financial professionals need a consistent and repeatable sales process to obtain better and more consistent conversions, click here. Think you know everything in this business? Think again. If there’s one thing about the financial services industry is that there is always something new to learn. Whether that’s a new product, marketing approach, technology hack or business practice, the financial professional that puts ongoing education as a goal will always be able to provide more value to their clients. That’s because people achieve success not by accident. It’s a combination of hard work, risk-taking and learning. For most of us, it takes twenty years or more of hard work and ongoing education to become an overnight success. Make on-going education a goal, whether that’s reading a new business book every quarter, developing or enhancing a skill, like speaking in public, or putting money aside to develop your staff. An educational goal will typically pay tremendous dividends in the end. Or perhaps it’s time to start thinking about taking on a business coach to take your business to the next level. A skilled business coach will guide you and educate you on successful strategies you can implement to achieve extraordinary success. Everybody in this business says they grow from referrals, but are they setting a goal and tracking a specific referral goal? This year, you should consider taking the steps necessary to make generating more quality referrals one of your top goals. The key word is “quality” referrals. This sounds like an easy task, but in reality getting referrals takes a lot of different steps. Click here to learn the three steps to create more referrals for your business. Make this the year that you elevate and innovate your business by not only setting the four most important goals, but by also taking the time to measure your goals. While this is just a short list of four goals, what other goals should financial professionals be focusing on this year? Share your thoughts with us on LinkedIn, Facebook, or Twitter! During the last few weeks we have worked on dozens of life, long term care, disability and annuity cases working alongside our Advisors. We recently had a case where we looked at several Long Term Care strategies and recommended a MoneyGuard Solution as the one that was clearly in the client’s best interest. However the Advisor almost lost the sale to a keen Nationwide salesman with a strong conviction and salesmanship for the product he was offering and he focused on the benefits of Indemnity vs. Reimbursement. We helped save the case with Care and Reasoning and being more convinced in offering what was in the client’s best interest. The opposition was a Nationwide Salesperson offering CareMatters – a product very similar to MoneyGuard and in many cases a very viable and solid solution. We love both products. However in this case we were trying to solve for the most long term care benefit and had to refocus the client on that goal and NOT that maybe her daughter might care for her 25 years in the future and she could pay her more easily through an indemnity based solution. Below are some additional thoughts to consider. Reimbursement vs Indemnity should not be your focus. The main point is making sure your family is coordinating care and not having to provide care. When comparing apples to apples, MoneyGuard starts out at much more in monthly benefits and compounds to be a significant difference in monthly benefit available over time, especially at ages when a long term care event is likely to happen. You will have to be reassessed as needing care services at least annually for indemnity payments to continue. A reimbursement design allows for direct billing and direct payment, so a caretaker essentially supervises claim. Is a family member going to be qualified to provide the type of care needed? Will they physically be able to provide care needed? Will they be around and available to provide the care when needed in the future? Will family members all be in agreement as to what is needed for your care? Will there be government requirements for caregivers to claim the income received from you or for you to provide workers compensation insurance, etc.? Will there be pressure to use funds for purposes other than your healthcare? What will payment and care coordination technology look like in 30 or more years. NOTE: Women who cared for ill parents were twice as likely to suffer from depressive or anxious symptoms as non-caregivers. Source: Press release (August 2002). “Reverberations of Family Illness: A longitudinal assessment of informal caregiving and mental health status in the nurses’ health study,” American Journal of Public Health, as quoted in Family Caregiver Alliance, “Women and Caregiving: Facts and Figures,” FCA, https://www.caregiver.org/women-and-caregiving-facts-and-figures (accessed December 16, 2016). When you need to go on claim, you are assigned a case manager who is a single point of contact for the entire family to assist in all phases of the process (paperwork, care coordination, etc.- no call centers). Silver Brick Road – included with each MG contract, client and family can find providers based on geography, offerings, ratings, needs (what typically takes the average family 2-6 weeks takes 5-10 minutes! ), articles, videos, Care Circle, Assessments, pre-planning. Care Circle – keeps family and friends in the loop – anyone named in the Care Circle by the owner of MG receives an observation report by the Caregiver. This Care post is an email blast sent to each member of the Care Circle each day care is provided, detailing what care was provided that specific day, what is going on, what they did, what to do now. Assessments – puts a baseline on what to do – can also be a cognitive screen. Insured can do on self or Care Circle member can do the assessment on insured, receive guidance and provide suggestions. Next steps – we provide a list of the right questions a family should be asking potential caregivers. Bill pay – a way to pay caregivers directly without the need of sending a check to the family who then has to deposit and write out more checks to caregivers. Pre-planning – a service that allows you to plan for your care, develop a plan choose your care provider prior to being on claim. Allows insured to fully develop a plan based on a future need because of a diagnosis that does not have immediate affect but eventually will (MS, Alzheimer’s, rheumatoid arthritis, etc. – debilitating conditions that can work slowly over time). We save the plan in our system and when time comes for pulling the trigger for benefits there is no crisis management, the plan is already to go. Family has White Glove Concierge Care and with the dial of a toll free number, they are put in touch with your Concierge Caregiver to guide everyone through a difficult time. The only reason I would recommend Nationwide for you, is if you thought the slightly higher death benefit outweighed the loss of LTC Benefits. The Return of Premium Option is also better with Nationwide, but you are paying for this benefit and it is hardly ever invoked because you would have to give up your LTC Benefits and that almost never would make sense. And if you think you will need these funds back for some reason, then you are most likely committing too much of your portfolio today. Plus, this type of coverage would be more expensive to reacquire the same protections at older ages. Surrendering is also not recommended when there may be loans available from cash value. If you didn’t need care until your 90’s, then in hindsight the Nationwide product would be better, but you would have to carry that extra risk for more than 30 years. If you decide to stick with Nationwide no hard feelings. It’s what you believe is best that matters and either Nationwide or MoneyGuard provide you and your family solid protection. Having helped you decide to put a protection plan in place is most important to me. Sorry to carry on, but this is an important decision for you. She agreed on the importance of the decision and with thoughtful consideration stuck with the recommendation for MoneyGuard. Please do not hesitate to contact your Westland team any time. We are here to help. Advisor had a client who asked about life insurance that could generate tax free retirement income and called us for assistance. This is not unusual, your clients are seeing these ads and are targets every day for life, long term care, disability and retirement planning. You must make sure your clients know you can provide these services. Westland is your one-stop-shop to assist. This client was a younger solid earner. He could afford an extra $1,000 monthly to save toward retirement and had a new family that needed some added life insurance protection. We created a solution with indexed universal life that would accept the $1,000 monthly and provide $400,000 of initial life insurance protection growing over time to over $1,600,000 of protection. In addition, he would hypothetically be able to pull out over $140,000 annually to supplement retirement income at age 70 for 20 years. Please do not hesitate to contact Nancy or I at any time. We are here to help. Hopefully, you are thinking of clients right now where you can add real additional significance and value to their family with protection and legacy strategies. Call for your personalized case designs today. We are here at your service. Call Westland to discuss a case – we will gather information and then research options to recommend what we feel is the best solution for your client. Husband (72) wife (62) second marriage $3,600,000 investment portfolio. He had a solid LTC plan in place already and were evaluating options to address her LTC Risk. After looking at many LTC options we created a LTC plan for presentation and it included a recommendation for re-positioning $140,000 into MoneyGuard for her with 3% inflation and that he keep his current plan. She would receive the couples discount and have over $1,000,000 for care at age 85 (our target benefit after 23 years of inflation adjustment). Effect on portfolio was net worth at age 100 would go from an estimated $9,200,000 to $8,700,000 using financial planner and money manager assumptions. However, with a hypothetical LTC event factored in at age 85 and no insurance, portfolio value at his age 100 could drop portfolio value to an estimated $6,300,000 at age 100 for surviving spouse. Money manager made the following comments to Financial Planning Team. This may be an oversimplification, but it appears that the break-even on their expected rate of return for growth assets is around age 86 or so…if she goes to LTC. Obviously one doesn’t buy a MoneyGuard or similar policy for the death benefit, so the only remaining issue is at what point she would need LTC benefits, and how long that may last. If she lives beyond 86 and doesn’t need LTC, then the opportunity cost becomes greater than the potential of the LTC policy. At that point, it becomes more of a non-financial decision about peace of mind and longevity risk. If I were making the decision for my own policy, I’d evaluate the possibility of needing the LTC, based upon family history, health, etc. MY RESPONSE: It should be noted that everything in the MoneyGuard policy will be guaranteed by Lincoln vs. an expected rate of return that is hypothetical in your assumptions. Even with family history in her favor, you never know when something might happen, like a stroke, other debilitating sickness or accident. There are many schools of thought on these issues and I appreciate your input. Some people are much more comfortable with self-insuring. However, as a holistic financial planning team, would you be okay with a recommendation not to purchase some protection and an event happened? I guess the answer could be Yes, if it never happens or happens after age 86 and the expected returns are met or exceeded, and the LTC event was as expected or less than expected. What our analysis seems to indicate is that there is far greater downside risk for not much lost in upside potential. With the re-position for MoneyGuard protection, your values at age 100 for the older spouse show $8,700,000 Net Worth with or without our hypothetical LTC event. While NOT putting in place protection shows only about 6% more in upside potential to an expected $9,200,000 Net Worth at age 100. The RISK however, is a 32% potential loss to $6,300,000 if our hypothetical LTC event happened. So again, the question is; do you give up a potential gain of about $600,000 to eliminate a potential loss of about $3,000,000? Here is another way of looking at this. You are betting $3,600,000 (today’s portfolio value) and are expecting a $8,700,000 pay off if we re-position the $140,000 today. Or do we bet $3,600,000 and might get $9,200,000 if we win (no ltc event) or $6,300,000 if we lose (having hypothetical ltc event). By the way… it is about a 70% chance that you lose and 30% chance that you win. What will most clients be more appreciative of? If you help them prevent taking a big hit or squeezing out a little more yield? I sincerely understand though that this couple should be just fine no matter the decision. NOTE: The financial planning team highly recommended re-positioning the $140,000 into MoneyGuard. We are in the process of implementation. If you do not have the time to commit for doing insurance work, then assign insurance work to an associate or allow Westland to assist. What would you pay an associate? 50%? Westland will be your associate for 25% or less depending on your role. Best of all you are keeping it all in your control and not allowing any competition to creep into your practice. We just become part of your practice just like an associate. Client, Female age 68, with first grandchild having first birthday. Her Advisor mentioned the cool Legacy Gift Idea, and she said great idea! Her mother (Great Grandma) contributed $1,000 and she committed to $100 monthly for 20 years into a Indexed Life Program for grandson. Expected results: $25,000 invested over 20 years, cash value expected of only $40,000 at year 20 and with a death benefit of over $200,000 and growing from day 1. Nothing too exciting, yet, but wait. By year 40 the cash value is expected to be over $160,000 and the death benefit over $400,000. By age 65, the cash value is expected to be near $1,000,000 and death benefit over $1,200,000. Quite a legacy from only a small initial commitment. Using a savings calculator on Bankrate.com with a 6% assumption, the result at age 65 is about $750,000 with no insurance. There are extra bells and whistles with the Legacy Gift Idea (tax free distributions-loans for example). Start letting your clients who have children and grandchildren know about this and you will be surprised how many will move forward. Call us for a customized illustration for a case today, maybe for your own child or grandchild! Tax free withdrawal of $23,000 to help pay for college expenses and $44,000 tax free supplemental retirement income. That is a wonderful legacy for you to be remembered by. We met with an advisor and discussed ideas to help him boost revenue while helping many clients and prospects. We discovered a couple ages 59 and 58 who he had completed some retirement planning work with and they were going to be just fine according to his E-Money Capital Needs Projection. However, we modified the model to test for several scenarios. This planning session led to a 15 year term sale on her and traditional LTC insurance on both. They didn’t have the portfolio to justify a linked benefit strategy, but we did look at all options. Partner with Westland and allow us to help you figure this all out and be by your side if needed when presenting solutions to your clients. Hopefully you are thinking of clients where you can add real additional significance and value to their family with protection and legacy strategies. Couple both age 60 had been experiencing long term care needs of a parent and definitely wanted to pursue putting a plan in place now while they were healthy. They didn’t want their children to repeat what they have been going through with Mom. This couple had a solid portfolio and a retirement action plan. The Advisor identified about $120,000 that could be repositioned to address this risk. We looked at several options (Traditional LTCi, John Hancock, State Life, Pacific Life, Nationwide…) and recommended MoneyGuard with a 3% inflation rider and 6 year benefit. This seemed to fit their specific situation best. Him – deposit of $55,030 to produce a $3,000 initial monthly benefit. Total initial death benefit was $92,831 and LTC pool of benefits of $232,863. This would grow to $6,281 monthly benefit and a LTC pool of benefits of nearly $500,000 at age 85. Her – deposit of $62,084 to produce a $3,000 initial monthly benefit. Total initial death benefit was $117,215 and LTC pool of benefits of $232,863. This would grow to $6,281 monthly benefit and a LTC pool of benefits of nearly $500,000 at age 85. These clients will always receive a benefit. A solid death benefit if care is never needed or can tap into a significant LTC benefit if Care is needed. At Westland, we understand the value of committing a portion of a clients’ portfolio to insurance that creates large assets just at the time they are needed most, no matter when that may be. Your client’s heirs will think you are a hero for doing such a good job of protecting their family portfolio. Partner with Westland to help you figure this all out and be by your side if needed when presenting solutions to your clients. Couple ages 59 and 58 actually called with a request for long term care protection after thinking they have done pretty well, but that LTC was one hole in their plan they haven’t addressed yet. This goes to show, that if you are not mentioning LTC you may be missing the boat. Your clients are thinking about these risks. Some clients are fearful of a long term dementia and lifetime benefits really resonate – recommend State Life.- Also has money back guarantee from day one. Some clients like the higher death benefit offered by John Hancock should care not be needed. Many other options can be considered in a case like this including traditional LTC with no death benefit or money back guarantees. If the funding source was another annuity or IRA, then State Life would be on top of the list. There are also LTC annuities to consider should there be health issues or large deferred annuity gains that can be used for long term care on a tax free basis. For Professional Use Only-Securities offered through The Leaders Group, Inc. Member FINRA/SIPC 26 W. Dry Creek Circle, Suite 575, Littleton, CO 80120, 303-797-9080. © 2016 Westland Financial Services Inc.